You will find San Lorenzo Church just off the elegant Corso Palladio in Vicenza’s historical heart. In a city which has become synonymous with Palladian architecture, this imposing Franciscan church from the end of the 13th century offers a perspective on how buildings used to be approached and designed in the Middle Ages. In my walks around town I often pass by its splendid marble portal and elongated body. I have also often tried to do it justice by capturing with my camera different details and angles of it. I have never been truly satisfied though, as the church is huge and impressive, so I have always found it difficult to accommodate it all in one shot. Looking through my photo folders today, I came across this picture. I took it around Easter this year – which explains the blue sky (if I haven’t complained to you already, let me tell you that Vicenza has been lashed by cold rains for the past few days to the point where it feels like summer has never been). The little square in front of it is a like a sun trap and the tables are often busy with people enjoying the strong Italian espressos the local cafes serve. It can be both a very busy and a very quiet place. On days when antique, art and food markets are held in town, stalls – overflowing with Italian delicacies and rare artifacts – fill the square and the adjacent street called Corso Fogazzaro. It was built in the 40’s of the 14th century by the Venetian sculptor and architect Andriolo de Santi. The money for it was donated by Pietro da Marano (known as Il Nano) – an adviser to the ruler of Verona – who was hoping to atone for his sin of usury. the lions which support the front pillars by the large entrance door. You can tell that the medieval master who sculpted them had quite a different idea to us as to what a lion must look like. You can also tell a lot about the passage of time by looking at these lions, as pieces of the statues have cracked and fallen off with the lion faces being the most affected. the rope-like long decorative elements which have been chiseled in the portal. They give it a lovely texture and draw your eyes up towards the stone figures in the lunette of the portal. There you can see the Madonna with the Child Jesus surrounded by St. Francis, St. Lawrence (Lorenzo in Italian) and the kneeling Pietro Il Nano. the more details you see. I manage to discover something new every time that I dedicate a minute or two to actually look at it, rather than just noticing it in its entirety before I walk into the church. Inside, the San Lorenzo Church feels incredibly big and a bit empty, especially if you have been expecting to see ornate full wall frescoes and a multitude of statues. Instead, there are separate works of art, which you are welcome to explore one by one. Take your time here, too. Once again, the more you look, the more you will see. the quiet cloister you can reach through a door at the altar-end of the church. Spending time in it, surrounded by greenery and statues, is especially nice on hot summer days. the San Lorenzo Church may seem today, it is interesting to note that its history has been quite tumultuous for the many wars and battles this part of Italy has been through. As such, Napoleon’s army first used the church as a hospital and then as quarters for its soldiers. And during the First Wold War, it became a food supply warehouse. 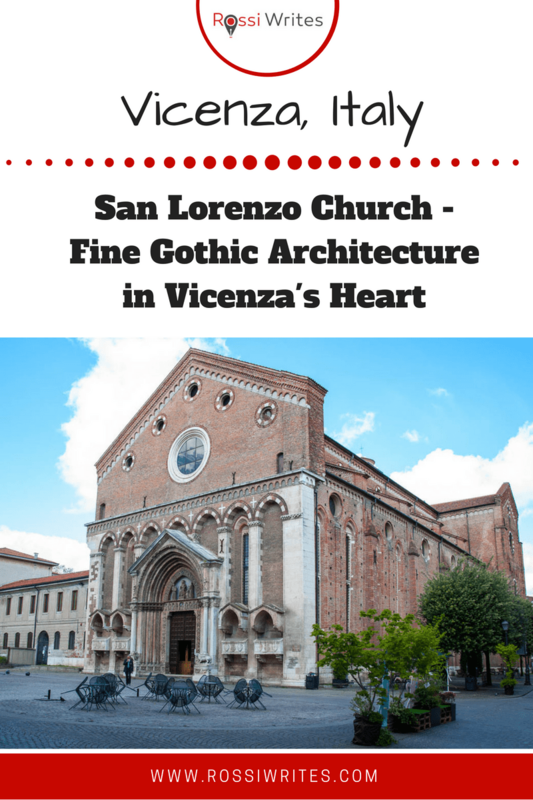 Don’t miss seeing the San Lorenzo Church when you are in Vicenza. It is a tranquil place with lots of stories to tell if you are willing to dig a bit deeper beyond the immediately obvious. This post is part of my blog series ‘Photo of the Day’. I use it to share with you several times a week photos which reveal the beauty and the reality of living in Italy and travelling in Europe. These are usually short posts (sometimes more of a caption, really), so that you can enjoy them on the go and use them to bring a ray of colour into each of your days.